DALLAS, Jan. 7, 2019 /PRNewswire/ -- Pizza Inn is sure to steal a pizza your heart with the new Philly Cheesesteak Pizza now available system-wide. The new addition to the All Day Buffet is not just any ordinary slice. 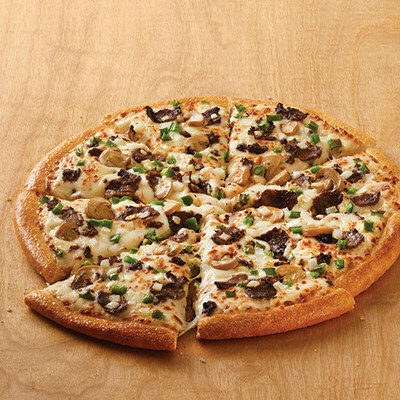 This delicious pie is loaded with steak, onions, green peppers, mushrooms and mozzarella cheese layered on top of Pizza Inn's signature Alfredo sauce. "We took a classic sandwich favorite and made it into one of our signature pizzas that's perfect for the winter months," said Denise Pedini, Executive Vice President of Marketing. "Nothing says football playoffs like a good Philly Cheesesteak. We can't wait to hear what our customers think of it after they take their first bite." The new Philly Cheesesteak Pizza isn't the only exciting thing happening at Pizza Inn. During January and February, customers will receive double reward card punches while dining on Wednesdays. The popular pizza chain is known nationwide for its exceptional pizza and friendly service. The restaurant's original pizzas blend everyone's favorite ingredients to create distinctively unforgettable flavor combinations with homemade pizza crust that is made fresh daily. Today, Pizza Inn, as part of RAVE Restaurant Group, operates more than 200 restaurants domestically and internationally. For the restaurant nearest you, and more information on the entire menu, visit pizzainn.com.